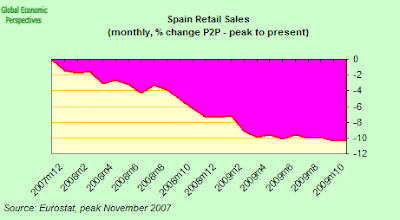 "Spain's weaknesses over the developing crisis reflect mainly the reversal of the continuous domestic demand expansion of over a decade, which was associated with high indebtedness of the private sector, large external deficits and debt, an oversized housing sector compared with the euro area average and fast rising asset prices, notably of real estate assets." European Commission assessment of Spain's Response to the Excess Deficit Procedure, Brussels 11 November 2009. Andrew Harker, economist at Markit commenting on the November Spanish Services PMI survey. According to Spanish Prime Minister José Luis Rodriguez Zapatero Spain's government is firmly committed to reducing its fiscal deficit, and is intent on lowering it as requested by the EU Commission by 1.5% of GDP annually, until it finally brings it within the EU 3 per cent of gross domestic product limit by 2013 at the latest. 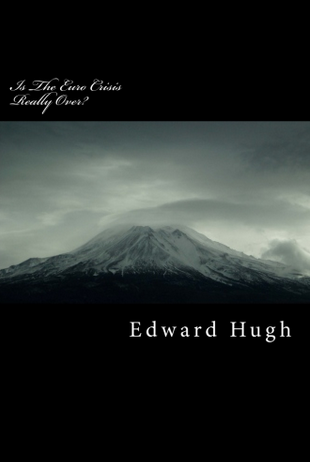 What's more he is quite explicit about how this is going to be possible: Spain is right now, and even as I write, on the verge of emerging from the long night of recession in whose grip it has been for the last several quarters. As such it will soon resume its old and normal path onwards down the highway of high speed growth. There is only one snag here: few external observers are prepared to share Mr Zapatero's optimism. “The return to growth and the expected fiscal consolidation will allow us to reach the stability pact objectives by 2013,” Mr Zapatero said in a speech last week, using a rhetoric by which few outside Spain are now convinced, and indeed only the day before the credit rating agency Standard & Poor’s had revised its outlook for Kingdom of Spain sovereign debt to negative from stable. The decision followed their earlier move last January to downgrade Spanish debt by revising their long term rating from AAA to AA+. S&Ps justified their latest decision by stating that they now believe Spain will experience a more pronounced and persistent deterioration in its public finances and a more prolonged period of economic weakness versus its peers than looked probable at the start of the year. So things have been getting worse and not better, and indeed, the EU Commission themsleves seem to take a similar view, since while they have lifted their immediate excess deficit procedure in the short term (see below) their longer term worries have only grown. Standard and Poor's feel that reducing Spain’s sizable fiscal and economic imbalances requires strong policy actions, actions which have yet to materialize, and the EU Commission and just about everyone else agree, and the only people who seem to take the view that the current policy mix is "just fine" are José Luis Zapatero, and the political party that maintains him in office. The change in the outlook stems from our expectation of significantly lower GDP growth and persistently high fiscal deficits relative to peers over the medium term, in the absence of more aggressive fiscal consolidation efforts and a stronger policy focus on enhancing medium-term growth prospects. Compared to its rated peers, we believe that Spain faces a prolonged period of below-par economic performance, with trend GDP growth below 1% annually, due to high private sector indebtedness (177% of GDP in 2009) and an inflexible labor market. These factors, in turn, suggest to us that deflationary pressures could be more persistent in Spain than in most other Eurozone sovereigns, which we expect would further slow the pace of fiscal consolidation in the medium term. Even some inside Spain are now openly questioning the viability of the government's strategy. The downward revisision in Spain's credit outlook, was "hard to deny," according to Spanish representative on the European Central Bank Governing Council, Jose Manuel Gonzalez-Paramo - "The ECB is not taking issue with whether Standard & Poor's should cut Spain's rating, but the report that accompanies this warning is hard to deny" he told the Spanish Press agancy EFE, adding that he was "convinced that the Spanish authorities share this analysis and will do whatever is needed to avoid S&P's negative outlook resulting in a change in rating". However Standard and Poor's explicitly justified the negative outlook by referring to the fact that Spain was not showing signs of taking adequate action to cut its longer term fiscal deficit as required by the EU Commission, and Spanish Prime Minister Jose Luis Rodriguez Zapatero himself stated he could see no no reason why ratings agency Standard & Poor's should downgrade the long-term sovereign debt rating of Spain. So it is hard to share Gomez-Paramo's (rather diplomatic) optimism at this point. Just how realistic is the view being taking by the Spanish administration at this point, and just what are the prospects of that imminent and sutainable return to growth in the Spanish economy on which everything seems to depend? That is the question we will try to ask ourselves in that follows. Certainly the situation we are looking at is a rather peculiar one, since Mr Zapatero's recovery hope seems to be a widely shared one inside Spain. 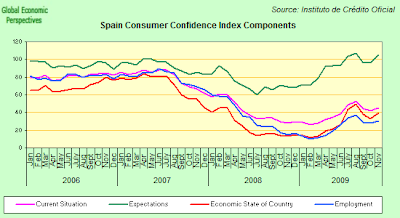 Certainly, if the ICO Consumer Confidence reading is anything to go by, Spaniards are feeling pretty hopeful at this point that the worst of the economic crisis is now behind them. Evidently confidence is still not back to its old pre-crisis level, but it is now well up from its July 2008 lows. What is even more interesting is to look at the breakdown of some of the ICO consumer confidence index components. According to the ICO data series I looked at, the expectations index has only been above the present level three times since the series started in January 2004 (in September 2004, in January 2005, and in August 2009). That is, the Spanish people currently have the third highest level of expectations about the future registered at any point over the last five years. I find that pretty incredible. Evidently Mr Zapatero is not alone in assuming that S&P's have it wrong. But is such a viewpoint rationally founded, and even more to the point, is there any economic justification which lies behind it? What could explain such dyed-in-the-wool optimism? It is hard to understand, unless, perhaps, the alternative - that Spain is in for a long and difficult economic correction, after many years of relatively "painless" economic growth - is very hard to contemplate for a population who are severely unaccustomed to such pressures. Possibly the Financial Times' Victor Mallet puts his finger on another important ingredient - after two years of being told that they have been living though the worst crisis in recent memory, many Spaniards have quite simply never had it so good, so how could anything horrible possibly happen now? The pre-Christmas mood in Madrid is a curious mixture of pessimism and cheeriness.On the one hand, anxious Spaniards are told they are suffering the worst economic crisis in 50 years and fear for their jobs. On the other, those still in employment have rarely had more money to spend. It is not surprising that the city’s restaurants are packed with noisy but neurotic diners as the holiday season approaches. The reasons for this odd combination of economic gloom and robust personal consumption are no secret. 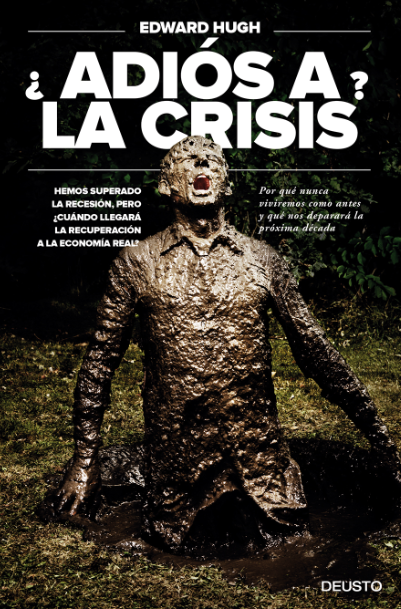 Unemployment has risen sharply – to 18 per cent of the workforce in Spain – but emergency measures around the world to avert another depression have kept economies flush with liquidity and cut interest rates (and monthly mortgage payments) to historically low levels. Inflation is low or negative. Low interest rates, safe jobs (or pensions) and salaries rising faster than the rate of inflation all combine to make "the worst" not that bad at all, especially if the government are shelling out 12% percent of GDP per annum to pay for it all. But as Javier Díaz-Giménez, economy professor at IESE business school says (and S&P's well know) “It is easy to raise the deficit to 10 per cent of GDP....But we really don’t know how to get back down to a deficit of 3 per cent of GDP.” This then is the problem, especially as a reducing deficit, rising taxes and utility charges, and eventually rising interest rates all make the task of restoring economic growth seem a rather daunting one. "The scale of the task of creating sustainable jobs in the international tradable goods and services sectors, is illustrated... by stark statistics from State agency, Forfás, which show that in the ten years to 2008, less than 4,000 net new jobs were added by foreign and Irish-owned firms, while overall employment in construction, the public sector, retail and distribution, expanded by over half a million......Total Irish employment in December 1998 was 1.54 million and was 2.05 million in December 2008 - a surge of 33 per cent. In the peak boom year of 2006, 83,000 new jobs were added in the economy while direct job creation in the export sectors was less than 6,000." I don't have the comparable Spanish figures to hand, but the situation is surely not that different. There was no let up in the contraction in the Spanish manufacturing sector in November, and PMI data pointed to a further deterioration of operating conditions. Moreover, the rates of decline of key variables such as output, new orders and employment all accelerated during the month, with the seasonally adjusted Markit Purchasing Managers’ Index falling to 45.3, from 46.3 in October. The Spanish manufacturing PMI has now been below the neutral 50.0 mark for two years, with the latest reading being the lowest since last June. 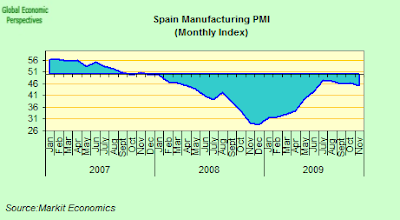 The impression gained from the PMI data is broadly confirmed by the monthly output statistics supplied by the Spanish statistics office (INE) to Eurostat. True, in October the output index was up fractionally over September (a preliminary 0.29% on a seasonal and calendar adjusted basis), but there is no sign of any sort of recovery and the drift is still downwards. Output has now fallen around 32% from its July 2007 peak. 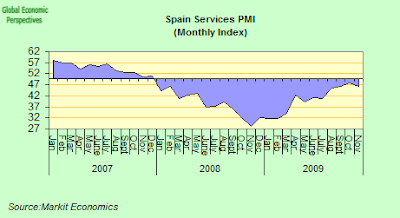 Nor is the situation in the Spanish services sector much better, and November PMI data indicated that operating conditions among Spanish service providers worsened again during the month, and at a sharper pace than in the previous survey period. Business activity, new business and employment all fell more quickly than in October. The headline seasonally adjusted Business Activity Index – which is based on a single question asking respondents to report on the actual change in business activity at their companies compared to one month ago – dropped to 46.1 in November, from 47.7 in the previous month. The latest reading pointed to the fastest rate of decline since August. 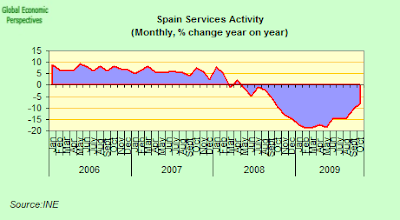 The situation is also confirmed by the Spanish INE Services Activity Index, which shows that activity was down 7.9% in October over October 2008, following a 9.8% drop in October 2008 over October 2007. Which means that activity was own a total of 17.4% from the July 2007 peak, or an average of 23% over the three months August - October, just better than the 25% average drop registered in January to March. Which means that while there is plenty of evidence that the contraction has stabilised during the last six months, this seems to be stability with a negative (and not a positive) outlook, given that things have now started to deteriorate again, and we must never forget that this stability has been achieved via a massive fiscal injection from the government, an injection which cannot be sustained indefinitely. Activity fell around one percent in October over September. While total output is now down nearly 35 percent from the July 2006 peak. That is to say, this Christmas Spanish construction output will have been falling for nearly three and a half years, and this decline is going to be permanent, the only outsanding issue is what activity is going to replace it. 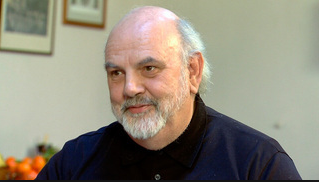 Spain's Employment Minister Celestino Corbacho was widely quoted in the Spanish press last week as saying that he could see clear signs that the housing market had "bottomed". I would really badly like to know where he is finding such signs. 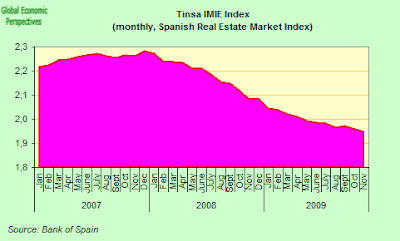 In the first place Spain’s residential construction sector continues to shrink at an unprecedented rate. Housing starts fell by 47% (to 33,140) in Q3 compared to the same period in 2008, according to the latest figure from the Ministry of Housing. If we exclude social housing the fall was much greater - 61% less homes started in the period, and even 20% down compared to the second quarter. At the other end of the production line the Housing Ministry reported 83,500 construction completions in the third quarter (excluding social housing), 41% down year on the same time last year and 13% down on the previous quarter. Over a 12 month period construction completions were down 35% to 444,544, and this in a market where sales of new properties are running at a rate of something like 200,000 properties a year. That is to say, the stock of unsold houses continues to swell. And prices continue to fall, since even though the Tinsa property price index for November showed that average prices fell by only 6.6% over the previous 12 months (down from 7.4% last month - the smallest annual fall in a year) this piece of data is not that illuminating in a market where prices have now been falling for more than twelve months. So while TINSA's own annual price graphs make for a very encouraging looking trend line, you need to remember that they plot the percentage change in house prices on an annual basis. If we look at the overall index (below) we see pretty much the same picture as with everything else, slower decline, but decline nonetheless. No bottom hit yet. And, of course, if we look at the peak to present chart, then the percentage fall simply continues, and house prices are now down 14.75% on the December 2007 peak. 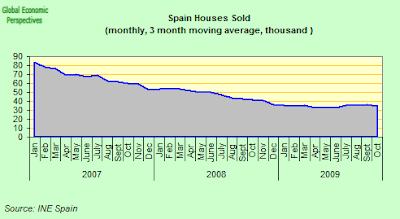 And it isn't only sceptics like me who think there is still a long, long way to go with Spain's house price adjustment. 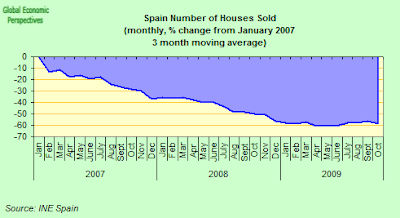 According to the latest report on the housing market by BBVA, Spanish property prices were 30% over-valued at the end of 2007, since they only fell by something like 10% in 2008, they have another 20% or so to drop before the correction is over. BBVA thus expect prices to fall by 7% in 2009, 8% next year, and 5% in 2011 Prices won’t stabilise until 2012, and the price correction is likely to be a protracted and long drawn out affair. What the likely impact of this on the real economy, and on their balance sheet, is likely to be they don't say. BBVA mentions another key reason why the fall in Spanish house prices is far from over - the high ratio of house prices to annual disposable income. This ratio (house prices / annual disposable income) rose to 7.7 years at the height of the boom, and has now fallen back to 6.6 years. But that is a long way off the historical average of 4, not to mention the 3.5 it has fallen to in the US. Meanwhile, a new report from BNP Paribas Real Estate, the real estate arm of French bank BNP Paribas, argues that banks in Spain (currently the largest holders of unwanted real estate) will need to start offering bigger discounts (of up to 50% in 2010 they suggest) if they are to really start to move their stock of property. Spain's banks claim to be offering discounts to buyers, but as BNP Paribas Real Estate argue, judging by the growing inventory they hold, these are not big enough to attract the volume of sales they really need. In fact, after several months of dithering towards a recovery the Spanish housing market fnally relapsed again in October, with the number of houses falling by 24% compared to the same month last year, according to the latest figures from the National Institute of Statistics (INE). In fact sales in October fell below the 30,000 transactions per month rate for the first time since last April. Sales were down by 10% over September. According to Mark Stucklin of Spanish Property Insight the explanation for this relapse is to be found in the breakdown between new build and resales. During the first half of 2009 sales of newly built homes were significantly higher than resales, whereas in normal years it’s the other way around. Indeed, if new build sales hadn’t been higher this year the market crash would have been significantly worse. But many of the new build sales recorded this year were actually sold off plan during the boom, and many others were banks buying properties from developers to keep them afloat, so not they were not really sales at all. Naturally, as those sources of sales start to dry up (either as the stock of sold off plan evaporates, or banks cannot accept too many more), then new build sales begin to head south. 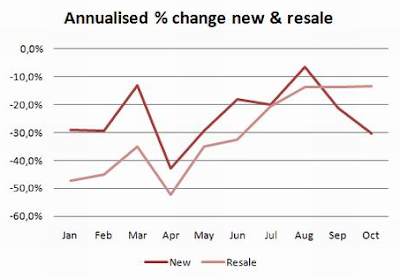 As you can see from the above chart which Mark produced for his post, new build sales dropped sharply in October, almost to the level of resales. And if we look at the rate of monthly house sales in the P2P chart below, you will see that monthly sales have now dropped by neary 60% from their peak. That is to say, we are still having something over 400,000 new houses coming off the production line, and only a maximum of 200,000 new home purchases. Even as output drops towards an annual 100,000, this level of sales would only clear off the backlog at a rate of something like 100,000 a year, which mean we would be well over a decade clearing off that massive backlog, and meantime who foots the bill for maintaining such a large stock? The chart above tells the story eloquently. It shows cumulative sales over 12 months to the end of every quarter, and you can see how the market has shrunk from just above 1 million sales over the 12 months to the end of Q1 2006, to just above 400,000 sales at the end of Q3 this year. In terms of transactions, the market has shrunk by around 60% over that period. And we get a similar picture on the mortgages front, with the volume of new residential mortgages signed in September being 62,411, down 4.2% compared to the same month last year. 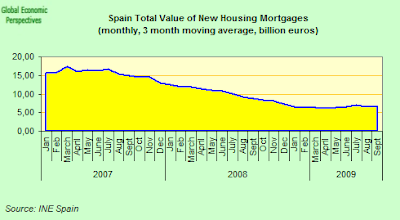 In value terms the fall was more pronounced, with new residential mortgages dropping 16% to 7.3 billion Euros. The good news is the annual decline in new mortgage lending has been bottoming out in the last few months. It fell 31% in June, 19% in July, 7% in August, and 4.% in September. And looking towards the future again, the number of new homes started in the third quarter was down 54% compared to the same period in 2008, according to the latest figures from Spain’s College of Architects. Excluding social housing, there were just 17,500 planning approvals in the third quarter, compared to 28,400 last year. 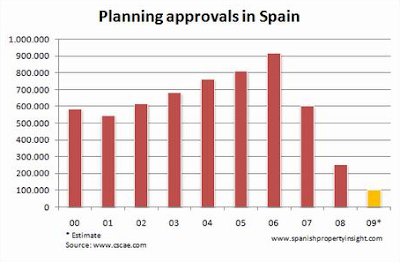 To put this into perspective, planning approvals were down by 94% from the 287,000 granted in the third quarter of 2006, at the height of Spain’s construction boom. The chart (below, and which comes again from Mark Stucklin) shows just how dramatically Spain’s residential construction production chain has collapsed in the last few years. This year there are likely to be a total of just over 100,000 planning approvals, the lowest level in more than 20 years. Spain's registered jobless total rose for the fourth consecutive month in November according to data from the employment office INEM, and is obviously bound to rise further as the recession drags on and the multi-billion euro stimulus package gradually loses steam. Seasonally unadjusted data showed Spanish jobless claims rose by 60,593 in November from October to reach a total of almost 3.9 million people, almost a million more than a year ago. The rise was milder than the almost 100,000 layoffs in October and leap of around 170,000 seen in November 2008, but this should not be taken as a sign the economy will begin to create jobs any time soon. Data showed the jobless rate in the service industry rose 1.7 percent month-on-month and by 1.3 percent in construction. Joblessness also increased by 0.6 percent in the industrial sector and by 2.6 percent in agriculture. The Spanish government has injected some 8 billion euros (nearly one percent of GDP) into the economy this year in order to create more than 400,000 mostly low-skilled jobs in order to put a temporary patch on the hole left by the paralysed housing sector. The 30,000 or so infrastructure contracts created under what is know as plan E will be completed by the end of the year, and with little sign of a general return to growth, or a revival in job creating activity the majority of those employed on these projects will surely soon be finding their way back onto the dole queues. The government has announced plans for a new 5 billion euro stimulus plan for 2010, but this, in theory, will be aimed at sustainable long-term growth sectors like renewable energy, environmental tourism and new technologies. November's 1.5% rise in jobless claims is nonetheless weaker than the 2.6 percent rise in October, the 2.2 percent in September and the 2.4 percent in August. And the annual rate of increase fell sharply, from 42.7% in October to 29.43% in November. But does the month mark a new trend, or will we see renewed deterioration as the winter advances? 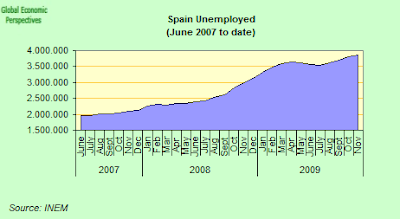 The Spanish administration officially provides only quarterly (unadjusted) data on the unemployment rate but does forward a monthly (and seasonally adjusted) rate to according to the European Union statistics agency Eurostat, based on the Labour Force Survey (which is generally regarded as a more accurate (and internationally comparable) assessment of the true level of unemployment than simple Labour Office signings. This stood at 19.3 percent in October, the second highest rate in the entire EU, and behind only Latvia. Of course, as ever with this administration, hope springs eternal. The Spanish economy will likely return to growth early next year and start creating new jobs toward the end of next year, according to Finance Minister Elena Salgado: "I think there is a high probability we will start to grow in early 2010," she told the Cadena Ser radio station, although she did admit that the trend of rising unemployment will not likely be broken until late 2010 or early 2011. "We think we will start to see net job creation in some sectors at the end of 2010, and more clearly in 2011," she said. 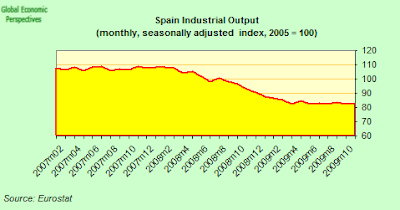 This realism about job creation is, of course, a by-product of the very low 2010 growth rate envisaged by even the optimistic forecast of the Spanish government (less than one percent), which given the need for drastic productivity improvement in Spain would evidently not be enough to create new employment. And, of course, others are less optimistic, with both the EU Commission and the IMF foreseeing negative growth in 2010. 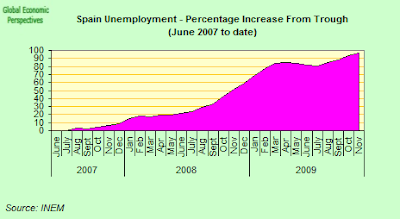 Indeed the EU Commission still anticipates unemployment to be over 20 percent in 2011. Basically the outlook is bleak, and unemployment is far more likely to continue rising than it is to fall. My own current estimate (which in part depends on how much consumer prices fall, on how seriously the government follows the agreed 1.5% reduction in the fiscal debt, and on how rapidly interest rate expectations rise at the ECB) is that we should be moving towards the 25% range around next summer. Despite the best efforts of the Spanish government stimulus programme household consumption continues to decline, at a slower rate in the third quarter, but still decline. The quarter on quarter drop was 0.1% as compared with a 1.5% drop in the second quarter, and a 2.4% fall in the first one. On an annual basic household consumption was down 4.2% in the third quarter following a 7.5% drop in the second one (see chart). And retail sales simply keep falling, more slowly than before, but down and down they go. In October they fell back again over September, and were down a total of 10.3% from their November 2007 peak. So Why Should We Expect Recovery In 2010? 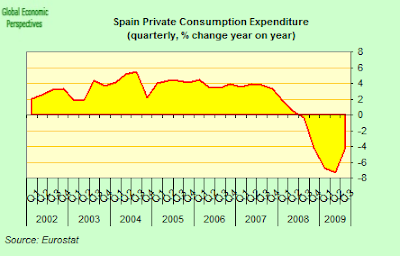 Or better put, why should we suspect that we might not see a Spanish economic recovery in 2010? Well, let's take a quick look at some of the structural features of Spanish GDP. As the Spanish administration never lose an opportunity to point out, Spain's economic contraction to date has been significantly less extreme than both the Eurozone 16 and the EU 27 averages. GDP never actually declined as dramatically as it did in some other countries. 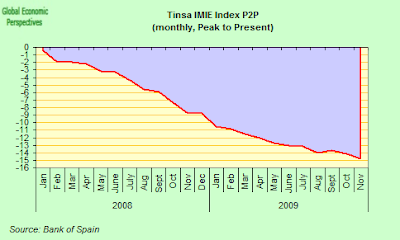 But looking at the situation in this way is rather misleading, since in fact, as can be seen in the chart below (which comes from the Spanish statistical office - the INE - as does the chart above) in fact domestic demand in the Spanish economy fell every bit as rapidly as in other European countries, but this was offset by changes in the external balance which moved in such a way as to add percentage points to the final GDP reading. 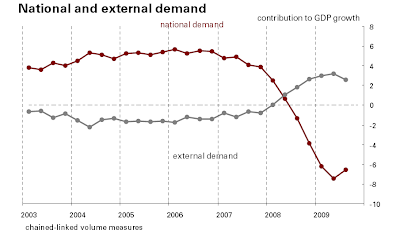 On analysing the two main components of Spanish GDP from the expenditure side in in the third quarter, the INE found, on the one hand, that national demand reduced its negative contribution to annual GDP movements by nine tenths as compared with the previous quarter, from minus 7.4 to minus 6.5 points, whereas conversely, the external balance reduced its positive contribution to aggregate growth by seven points, from 3.2 to 2.5 percentage points. 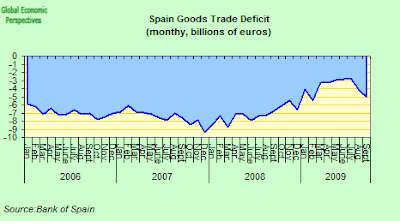 Now all of this is, as I say, rather strange to those unaccustomed to the niceties of GDP analysis, since the positive contribution from external trade to GDP growth has got nothing to do with extra exports, but rather it is a product of the fact that Spain was running a whopping trade deficit, and simply reducing this trade deficit gave the positive impetus to GDP, whereas the third quarter negative impact of external trade was the product of, guess what, a further deterioration in the trade balance as imports once more started to rise more rapidly than exports (see chart below). It is this dynamic - of yet another deterioration in the trade balance as the ression slows and as the government pumps demand into the economy - which raises concerns about long term economic stability, since obviously no susbtantial recovery in competitiveness has taken place. The thing is, behind this whole situation there lies the problem of debt, and indebtedness. 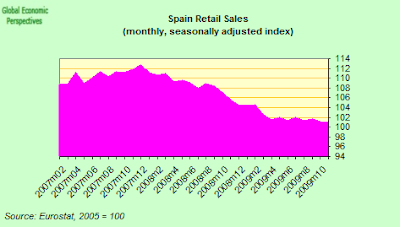 Basically, despite the fact that many, many Spaniards have never had it so good as they did in 2009, Spanish living standards have actually been falling since the amount of money available for current spending has been falling. What we need to take into account here is the sum of actual earned income PLUS what Spanish citizens are able to borrow during any given time period. Essentially when you borrow you shift disposable income from one time period to another. 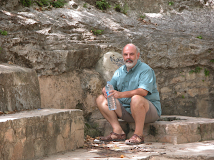 This is why Franco Mogigliani advanced what has come to be called the life cycle theory of saving and borrowing, since patterns change across the age groups, and naturally as whole populations age the pattern of any particular country changes. A younger country - Ireland, the US - is much more likely to be a net borrower, while an older country - Japan, Sweden, Germany - is much more likely to be a net saver. So why is all this important. Well, during the years you borrow, you spend more. I think this is obvious, and this is also why when there are less capital inflows there are less imports. Capital flows are to finance borrowing, and borrowing improves living standards in the short term, until it has to be paid back. Remember the saying, "I am a rich man till the day I have to pay my debts". Spain was rich in this sense, as José Luis Zapatero never ceased to remind its citizens. But Spain's citizens were rich based on very heavy borrowing levels - households owed about 100% of GDP, and corporates around 120% - borrowing which had been used to inflate land, house and commercial property values to well beyond their true market equivalents, and hence these "riches" were in fact very unreal. The impact of the sort of capital flows Spain was receiving is that in the short term your disposable income goes up (someone gives you money to spend), while later on it goes down (as you have to subtract from earned income to pay back). This latter situation is where Spain is now. The capital flows have been sustained in the short term via the ECB liquidity process, which has fuelled domestic demand via government borrowing and spending, but at some point all of this needs to be reversed and the debts need to be paid down, and that will mean lower disposable income (in terms of money to spend) for the internal population as a whole, which is why without sales abroad domestic consumption will only continue to fall and unemployment will continue to rise. The only way to compensate for this is to export and run a trade surplus, since in this way the debt payments can be made without subtracting from current income. 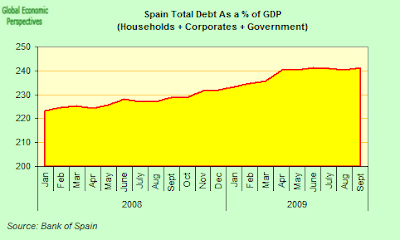 Indeed, as we can see from the chart below, despite the fact that households and corporates have now started deleveraging, total Spanish indebtedness (as a % of GDP) continues to rise, thanks in part to the growing indebtedness of the state (which is, in the end, a liability for all Spain's citizens), and in part to the fact that GDP is itself contracting. This is Keynes paradox of thrift at work if ever there was a case, since the more Spanish savings rise, the more indebted Spain becomes. And now, as the fiscal stimulus is withdrawn, if GDP falls faster, then the position may well not improve, especially if prices fall and Spain enters a deflationary spiral. Of course, borrowing is not income neutral in the longer term either, since it all depends what the borrowed funds are spent on. If you spend the borrowed money on infrastructure, education and new productive capacity (ie useful investment) then evidently you can raise the trajectory of GDP in the longer term, while if you only use it to finance short term consumption - or invest in a lot of houses no one really needs - then you simply get a destruction of internal productive capacity, massive price distortions and long term GDP on a lower trajectory. This is where Spain, Greece and much of Eastern Europe are now. Basically, for those countries who lack their own currencies there is now real alternative to a rather painful “internal devaluation” to restore export competitiveness and the trade surplus. And this of course is why everyone from Standard and Poor's to the EU Commission and the ECB are now insisting not only on a return to fiscal order, but deep structural reforms to restore competitiveness. 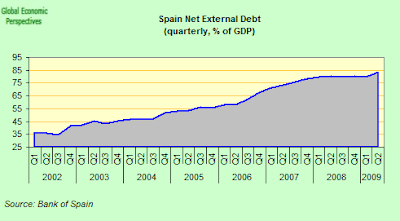 On 27 April 2009 the European Council (Ecofin, the Finance Ministers of member states basically) decided, in accordance with Article 104(6) of the Treaty establishing the European Community, that an excessive deficit existed in Spain and issued recommendations to correct the excessive deficit by 2012 at the latest. At the time this appeared to imply an average annual fiscal reduction of 1.25 % of GDP would be required over the period 2010-2013. The Council also established a deadline of 27 October 2009 for effective action to be taken. 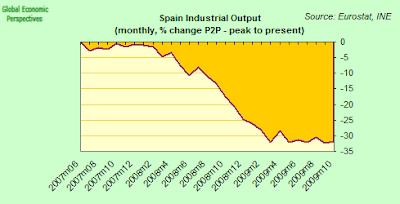 According to the Commission January 2009 interim forecast, Spain's GDP was projected to decline in by 2 % in 2009 and by a further 0.2 % in 2010. However, Spain's economic outlook deteriorated rapidly during the course of 2009 and the Commission autumn forecast projected a GDP decline of 3.7 % in 2009 and a further decline of 0.8 % in 2010 (basically the same as the IMF October outlook). As the Commission stress, the downward revision in nominal (current price) terms has been even stronger, since prices (and the GDP deflator) have been falling over the period, and this is a strong negative factor for both revenue and outstanding debt to GDP levels. Spain’s fiscal outlook also worsened in the course of 2009 reflecting this sharper-than-expected fall in economic activity. Notably, the Commission autumn forecast project the 2009 general government deficit to come in at 11.2 % of GDP, compared with the 6.2 % deficit envisioned in the January forecast. In particular, revenue has fallen sharply more than expected, as the result of the stronger-than-assumed fall in activity and of the fact that tax proceeds are reflecting falling activity much more strongly than the normal long-term tax elasticity considerations would have suggested. Thus in the Commission review of the Spanish Excess Deficit Procedure carried out at the end of October, they found that the plans for government expenditure foreseen in the January 2009 update of the Spanish stability programme had been broadly observed (and this is the big difference with the Greek case) although the expenditure-to-GDP ratio increased on account of the lower-than-expected nominal GDP level. 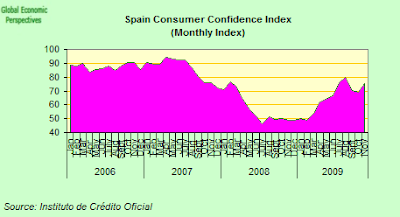 The Commission now expect the 2009 deterioration in the fiscal outlook to continue into 2010, although the discretionary fiscal measures adopted by the Spanish government post January 2009 were considered to have played no role in the intervening deterioration in the fiscal outlook. They thus took the view that "unexpected adverse economic events with major unfavourable consequences for government finances" had occurred and thus recommended a provisional lifting of the Excess Deficit Procedure, conditional on substantial further progress in bringing the deficit within the 3% of GDP limit by 2013. Looking ahead to 2010, the Commission took the view that the draft 2010 Budget Law published in late September 2009, which targeted a general government deficit of 8.1 % of GDP in 2010. was credible, given that the combined impact of the withdrawal of the temporary stimulus measures, on the one hand, and of the new discretionary measures presented in the draft 2010 Budget Law, on the other, could yield a significant improvement of the fiscal balance by some 1.75 % of GDP in 2010. 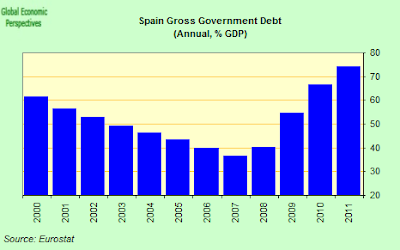 Further in the light of the unanticipated deterioration in Spanish government finances an average annual fiscal effort in excess of that originally recommended - at least 1.25 % of GDP - is needed between 2010 and 2013 in order to bring the headline government deficit below the 3 % of GDP reference value by 2013. The Commission aregue that this correction would represent an average annual fiscal effort of above 1.5 % of GDP over the period 2010-2013. The Commission autumn forecast, projects a government deficit of 11.2 % of GDP in 2009 and 10.1 % of GDP in 2010. Assuming unchanged policies, and GDP growth of 1 % in 2011, the deficit would then be 9.8 % of GDP. 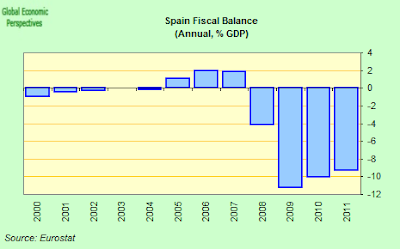 A credible and sustained adjustment path thus requires the Spanish authorities to implement the budgetary plans outlined in the draft 2010 Budget Law; ensure an average annual fiscal effort of above 1.5 % of GDP over the period 2010-2013; and, most importantly, to specify the measures that are necessary to achieve the correction of the excessive deficit by 2013. 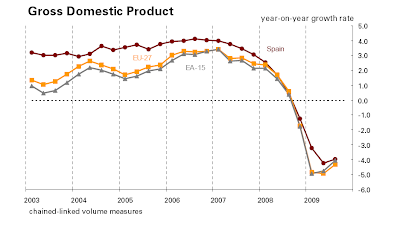 As the Spanish administration constantly point out, Spain's accumulated national debt is a lot lower as a percentage of GDP than that of many other EU member states, and even after 2011 will remain below the EU average. However, as given the difficult situation likely to be faced by Spanish banks and the heavier than average weight of ageing in Spain, the burden of Spain's finances in the context of an economy which may struggle to find growth over the next decade should not be underestimated. According to the Commission autumn forecast, general government debt is projected to reach 54.3 % of GDP in 2009, up from 39.7 % in 2008. Although it is currently still below the 60 % of GDP EU reference value, debt is expected to increase further in 2010 and 2011 to 66 % and 74 % of GDP respectively. And evidently there is strong downside risk here should growth be lower than anticipated, and/or prices fall, this number could rise significantly, and it could should Spain's banks need a substantial bailout at some point. As the Commission point out, the long-term budgetary impact of ageing in Spain is well above the EU average - mainly as the result of a projected high increase in pension expenditure as a share of GDP over the coming decades. The budgetary position in 2009 compounds the budgetary impact of population ageing on the sustainability gap. The Commission thus stresses the importance of improving the primary balance over the medium term and of further reforms to Spain's old-age pension and health-care systems in order to reduce the risk to the long-term sustainability of public finances. Indeed, the Council of Finance Ministers (Ecofin) specifically "invited" the Spanish authorities to improve the long-term sustainability of public finances by implementing further old-age pension and health care reform measures when they lifted the Excess Deficit Procedure at the start of December. The Council also invited the Spanish authorities to implement reforms with a view to raising potential GDP growth. As Standard and Poor's stressed, their decision to revise the Spanish sovereign outlook to negative reflected the perceived risk of a further downgrade within the next two years in the absence of more aggressive actions by the authorities to tackle fiscal and external imbalances. It is the continuing silence which surrounds this absence which is so ominous, and makes the concerns of the EU Commission and the various ratings agencies at this point more than understandable. Despite recent optimism about the apparent renaisance of growth in the Japanese economy, and the heightened sense of enthusiasm which surrounds the surge in economic activity right across the Asian continent there are considerable grounds for caution about the sustainability of the Japanese recovery itself. The first of these is to be found in the fact that, as has become plain from the latest batch of data releases, Japanese manufacturers are continuing to curb both capital spending, salaries and workforces, making any recovery in domestic demand driven by “second round” effects extremely unlikely. A further reason for having second thoughts is the long term decline in the level of Japan’s trend growth, which has fallen substantially over the last two decades under the impact of its shrinking and ageing workforce. Thus whatever the initial rebound, without the aid of strong demand elsewhere it is completely unrealistic to anticipate strong sustained growth in the Japanese case. And lastly it is evident that whatever the recent optimism Japan's economy still faces major challenges, and in particular the risk of getting caught in yet another deflationary spiral, a danger which was recently highlighted by the announcement that prices fell at the fastet rate in half a century in October. Indeed, fears that recent figures suggesting a robust recovery may have been a false dawn were only intensified last week when the Prime Minister himself sounded the official alarm that the country risked falling into a “double-dip” recession. With Japan’s export industry still reeling under the weight of the earlier sharp fall, and now bedeviled by both the plunge back into deflation and and soaring yen, Yukio Hatoyama made it plain that additional “measures are required so that the economy will not fall into a double-dip recession”. This warning, it seems to me, is not mere rhetoric, part of a political tussle between the government and the Bank of Japan, but refelects genuine concerns, concerns which have only been added to by the October industrial output data, and the November PMI readings. 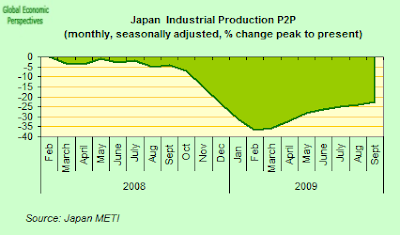 Clearly, any recovery from such a strong output fall as Japan has suffered was always going to incorporate some sort of initial momentum surge as final demand eventually adjusted to the sharp inventory run-down, but maintaining this momentum get harder and harder as we move forward, and the question we need to ask our selves is, "has all the low lying fruit now been picked". Certainly the Japanese government fears it might have been, and has now made plain that it is going to introduce a further spending package to fight deflation and to ease the impact of the stronger yen. At the same time they have called on the Bank of Japan to take stronger measures to support growth and avoid deflation. “There’s a risk that excessive currency movements, along with deflation, will hurt Japan’s recovery,” the government statement said. “The government will compile stimulus measures this week and closely monitor currency markets,” it added, without elaborating on the size of the package, while Finance Minister Hirohisa Fujii has been adding to the pressure on the central bank by explicitly suggesting quantitative easing would “help” the economy. The yen surged to a 14-year high against the dollar last week, only adding to the concern that a stronger currency will bring Japan’s recovery from its worst postwar recession to an early and untimely halt. At first sight Japan’s situation seems reassuring, since the economy seemed to have rebounded sharply in the third quarter as strong government stimulus measures sustained consumer spending and exports to rapidly growing Asian neighbours leapt upwards. The preliminary headline GDP reading even outpaced most economists' expectations, since the economy was estimated to have grown by 1.2% over the previous quarter (or at a 4.8% annualized pace). This was the second consecutive quarter of expansion, following four successive quarters of contraction, and the apparent pace was a marked acceleration over the 2.7% annualized pace of the April to June period. But even before the champagne bottles were uncorked nagging doubts started to appear, in the shape of the domestic demand deflator – a measure of the changes in the price of goods and services - plunged by 2.6%, the fastest pace of price decline recorded since as far back as 1958. This was the third straight quarter of falling prices in Japan, and since there is no real likelihood that this situation is going to be reversed soon the government has now officially recognised that Japan is back in deflation. In fact Japan's general index of consumer prices fell by 2.5% year on year in October, as compared with a 2.2% drop in the two preceding months. The headline figure was dragged down by a 6.8% drop in the cost of fresh food. Stripping out this component, deflation in core prices slowed slightly, to minus 2.2% compared with minus 2.3% in September. Although transport and communication costs continued to fall, the 4.6% contraction was the smallest fall in six months. The cost of housing fell by 0.3% and the cost of utilities fell by 9%, in both cases showing very little change from the previous month. When energy costs as well as fresh food are excluded, October prices were down by 1.1% after falling by 1.0% in September. But looking beyond deflation more grounds for concern emerged as analysts realised that the contribution of private consumer spending to growth actual fell back in the third quarter (mirroring an effect I have already drawn attention to in Germany), offering yet more evidence of the limits measures to convert Japan from export to domestic-demand-led growth were up against. Private consumer spending, which accounts for more than half of Japan's GDP, rose 0.7% on quarter, compared with a revised 1% climb in April-June. Worse, almost everyone recognises that both these increases were largely the outcome of the previous Liberal Democratic Party-led government's economic stimulus programme, including as it did handing out cash to consumers and rebates for people buying energy-saving home electronics. Finally, just last week we learn that revised estimates of capital expenditure by Japanese companies suggest that this fell at a faster-than-expected pace of 24.8% (from a year earlier) during the third quarter, as export pessimism in the face of a steadily rising yen and a struggle to show healthy profit numbers pushed managers towards holding off on new investment. In fact the July to October data mark the 10th straight quarterly decline in capex spending, and follow a 21.7% year in year drop berween April and June. The latest estimate is being seen by analysts as rather a bad omen, and habinger of bad news about to arrive, since the data will be used to carry out the first revision of the gross domestic product figures, and it is clear Japan is now about to cut the preliminary GDP reading sharply. Estimates of how large the write down will be vary, with anything between 0.9% (3.6% annualised) and 0.3% (or 1.2% annualised), which would mean virtually no real growth at all in the third quarter if you take into account the fact that inventory build-up accounted for 0.4 percentage points of the healine number. In any event this part will be clear when we get the new estimate later this week. Whatever the final number the news will be bad enough, unfortunately however there is more to come. 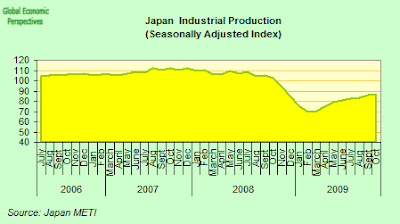 It is now abundantly clear that the earlier surge in Japanese industrial output is now slowing, and the latest official data show it rose only 0.5% between September and October, far less than the 2.5% range in economist forecasts, and so despite everything compared to October 2008 industrial output was still down by 15.1%. So while Japanese industry is rebounding, it is hardly surging, and we are left asking ourselves, has all the low lying fruit now been picked? 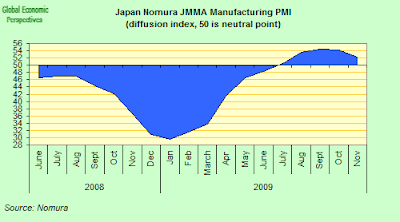 The results of the November manufacturing PMI survey seem to suggest that they have, since despite remaining above the neutral 50.0 level for yet another month , the seasonally adjusted headline Nomura/JMMA Purchasing Managers’ Index fell from Octobers 54.3 reading to a four-month low of 52.3, suggesting that growth in the Japanese manufacturing sector continued to lose momentum, and that growth in the fourth quarter will be even weaker than the revised third quarter number, and may well be negative. The survey organisers reported slower growth of both output and new business, even if job shedding eased to its weakest rate for fifteen months, while output price deflation the hit the fastest rate since December 2001. In addition pre-production inventories were reduced for the ninth month running. And Japanese services are hardly doing better, since the headline seasonally adjusted Nomura Business Activity Index fell for the third successive month to 42.3 in November, from 45.0 in October, indicating that sharp and ongoing contraction in Japanese service sector activity worsened, with conditions deteriorating at an accelerated rate, and indeed at the fastest pace since last May. Again survey respondents frequently mentioned further falls in new business, reflecting Japan’s increasingly uncertain economic prospects. This faster decline in services activity, combined with a slower expansion of manufacturing production, meant that Japanese private sector output fell at the most marked rate for five months during November with the Nomura Composite Output Index posted a reading of only 45.4. The composite index – which gives some orientation for GDP levels - has now remained below the 50.0 mark for three successive months. If this performance is repeated in December it is extremely likely we will see negative quarterly growth in the last quarter of the year. 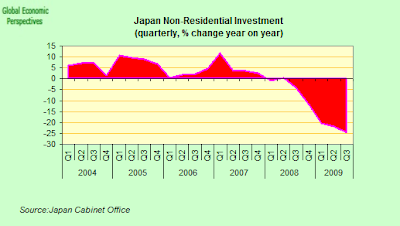 And as if all of this wasn't enough, Japan’s construction industry is unlikely to be a positive force, indeed housing starts may drop next year to a 48-year low as the sluggish economy and falling numbers of young married couples continues to eat into the housing market. The forecast was made byTakeo Higuchi chief executive officer of Daiwa House Industry (Japan’s largest homebuilder), who said starts for financial year 2010-2011 are likely to fall as low as 600,000, following this years 20 percent plus drop to 800,000. “The property market will remain sluggish for another year or two because Japan’s economy is in bad shape,” Higuchi said in an interview last week. “High unemployment and falling wages are scaring away many potential buyers.” Japanese home sales are forecast to drop 7.2 percent to 1.57 trillion yen in the year ending March. Japan’s started building 1.04 million new housing units last year, a massive and long term fall from the peak of 1.9 million dwellings hit as far back as 1972. Starts of 600,000 would be the lowest rate since 1961. With most of Asia’s economies currently booming, it may seem surprising to many that Japan seems unable to rise up on the back of this wave of high growth, especially since Japan – unlike much of Europe and the United States – is not saddled with financial system problemsof the kind which could be expected to put a brake on economic activity. The problem basically is the pass through rate. 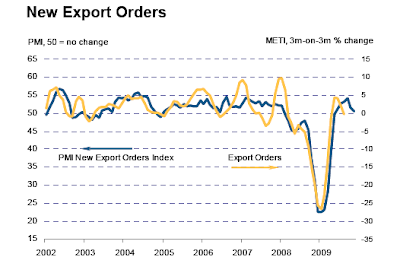 Japan has now become so structurally dependent on exports, that there is nothing like sufficient momentum from consumer demand to take up the strain when these fail, while on the other hand the return rate on capital has dropped so low during the present crisis, and the yen has risen so strongly, that manufacturers find themselves with little choice but to systematically curb capital spending and aggressively cut costs, beginning with payrolls of regular employees. For an autonomous recovery mechanism to go to work we would need to have a recovery in both corporate earnings and household income, but corporate earnings are only being sustained by cutting back capital spending, while employee income has steadily fallen, and is unlikely to revive again without a much stronger recovery in the other advanced economies. That is, Japan now needs to be pulled by the global train, and will certainly not itself be doing the pulling. 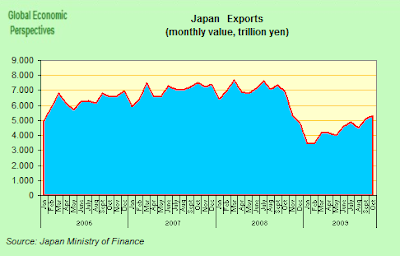 Basically during the good years Japan’s economy was being driven by robust global demand for its high-end manufactured goods (passenger cars, IT/digital products), which were made extremely cost competitive by the extremely cheap yen that was produced as a by-product of the carry trade. However all of that now belongs to the world which just fell apart. A man called Ben Bernanke is now running an interest rate and quantitative easing programme at the Federal Reserve which no longer makes the yen the preferred carry trade currency, while frugality has increasingly become the norm among European and US consumers who are desperately trying to deleverage. One consequence of this is that there has been a shift away from Japan’s high-end goods and toward less expensive Asian products, especially given the loss of price competitiveness produced by the yen’s rapid appreciation. Japan’s factory sector consequently finds itself saddled with substantial excess productive capacity and excess employment and unless there is a significant return to a cheaper yen over a viable time horizon this situation is, quite simply, unsustainable. Rather than simply sitting back and waiting for normal cyclical corrective factors to do their work, what seems to be called for at this point is a thorough overhaul of the national industrial structure, as well as a significant long term structural rethink about how Japan got to this unfortunate situation and what to do about it, and boths of these are likely to take years rather than months. Indeed, even if global demand were to pick up in the short term, Japanese producers may well be more inclined to shift production overseas, rather than renewing and increasing domestic capacity given the uncertainty which now surrounds the future value of the yen. In these circumstances the recent sharp drop in capital spending is hardly surprising. In is very striking how Japanese industrial activity is weakening just as the rest of Asia is surging. Even if Japan’s exports fell at the slowest pace in a year in October as government spending across the globe boosted demand, shipments abroad were still down 23.2 percent - a vast improvement, it should be noted, when compared with the 30.6 percent decline seen in September. 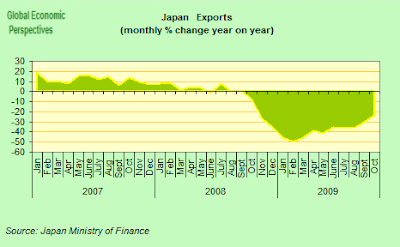 Exports in recent months have been quite solid, with real exports (the seasonally adjusted nominal export value divided by the BoJ’s export price index) up 3.4% month-on-month in October after a 3.0% month on month gain in September, with the result that the October level was 5.1% higher than the July-September average..
Imports have been much weaker, reflecting the underlying dynamic of Japan’s domestic consumption, and fell 35.6 percent from a year earlier in October, which meant the trade surplus climbed to 807.1 billion yen ($9.1 billion), its highest level since March 2008 and well above the 465.5 billion yen median estimate of analysts. When we come to look at the distribution of exports, shipments to Asia fell 15 percent year on year, easing back from a 22.2 percent drop in September. Exports to China, Japan’s biggest overseas customer, were down an annual 14.3 percent, a slight deterioration from 13.8 percent decline the previous month. Sales to the U.S. fell 27.6 percent, moderating from September’s 33.9 percent decrease while exports to Europe slid 29 percent after slumping 38.6 percent in September. In fact real exports to all major regions increased on a month-on-month basis in both September and October, with exports to the US and Asia increasing for the eighth- and ninth-consecutive month, respectively. Real exports to the European Union and oil producing countries also rose in both months. But there are differences, and these differences provide part of the key as to why we need to be cautious. In Asia solid final deman, led by China, lay behind the rise, but in the other two key regios renewed inventory building probably lay behind the rise. Specifically, real exports to the U.S. increased 5.0% month on month in October following gains of 3.7% month on month in September and 3.0% month on month in August. It is hard to explain such a strong gain by final demand and there is a clear possibility that what we have been seeing is a powerful boost to sales from renewed inventory building by Japanese companies in the expectation of future demand. Real exports to the EU show a similar pattern ,with strong growth being registered (up 7.0% month on month in October after rising 8.2% month in September and decreasing 4.0% month on month in August. In Asia the same picture of strongly increased real exports is evident, with a rise of 6.6% month on month in October following gains of 5.3% month on month in September and 0.3% month on month in August. However underlying GDP growth rates are much stronger in Asia, and it is likely that the increase is much more driven by final demand. Looking at more detailed data, exports to China gained 3.0% month on month in October after increasing 6.5% month on month in September and 2.0% month on month in August. This upward trend in China exports undoubtedly reflects the continuing positive impact of the various economic stimulus packages as well as some recovery in Chinese exports to industrialized countries. Meanwhile, exports to Asia excluding China surged 8.6% month on month in October after a 4.6% month on month gain in September and a 0.6% month on month drop in August. What is evident, at this point, is that the global recovery is proving to be more evasive than anticpated, with strong variation between regions and countries, and in the light of this heavily export dependent countries like Germany and Japan, after an initial surge forward are now finding it hard work to maintain momentum. 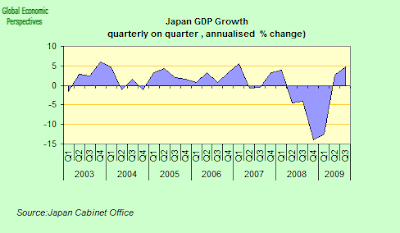 Apart from the factors mentioned above, one other reason not to expect some sudden and miraculous “bounce back” in Japan’s economic growth is the steady decline which can be seen in the country’s long term growth pattern (see chart below). This key fact here is surely the historic decline in Japan’s workforce (both ageing and now shrinking) the adverse effects of which are starting to be felt. To make matters worse, some long term consequences of repeated short term interventions (via the use of fiscal policy etc) in the private sector over the years of protracted stagnation we have seen since the 1990s. The impact of this cumulative neglect is to be seen not only in the mounting pile of public debt (gross debt will surely soon pass 200% of GDP, hitting limits never seen before in a developed economy), but also in the way overall labour productivity has been impaired due to substantial labour hoarding in non-efficient sectors. In addition to the short-sighted fiscal policies, expanded credit guarantees, intended to counter tight credit, have had similar adverse side-effects. While such macrostabilisation policies may have temporarily bolstered economic growth, and have certainly helped avoid large scale unemployment, at the end of the day they end up suppressing activity in more efficient and more profitable sectors, and in the long run exercise a downward drag on growth. Unfortunately policymakers seem not to fully realise the longer-term effects of loading on short-term policy package on top of another without adressing the underlying structural issues. Wages earned by Japanese workers fell for the 17th consecutive month in October, extending their longest losing streak in six years and adding further evidence that consumer spending is likely to remain subdued. Meanwhile on November 20th the government formally announced that Japan was back in deflation, effectively exerting pressure on the Bank of Japan to react, pressure which was only too evident in last weeks announcement by the bank of a new liquidity facility of roughly JPY10 trillion in three month loans to commercial banks. BOJ Governor Shirakawa, however, was at pains to make clear that even if he was willing to concede that the latest measure could be seen as a form quantitative easing, a term he has manifestly struggled to avoid using previously, there was no overall change in the BOJ’s economic assessment of the Japanese situation. Rather, the measure was designed to address what Shirakawa called the potential adverse effects on corporate sentiment caused by the rising yen and continuing weakness in share prices. Thus Japan's economy yet again slides steadily into deflation, but this time with no evident road-map or "script", or even credible short term hope of coming out again, a fact that is only adding to the general concern which is being expressed about where exactly it is that Japan is headed for. Certainly it would seem to be no good place. 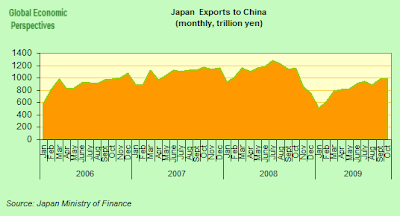 Further, if Japan is indeed teetering back towards recession, the implications will extend well beyond Japan itself, and will more than likely involve significant consequences for the entire group of developed economies, and especially those unable to tap into China's continuing growth via commodity exports. Japan was the first large economy to fall into technical recession in the wake of the Lehman Brothers collapse, but was also the first to heave itself out. Being the first to fall back in again would not be a good omen, for anyone.